Rhodes island is the largest of the Dodecanese islands. It is situated at the southeast of the Aegean sea in Greece. 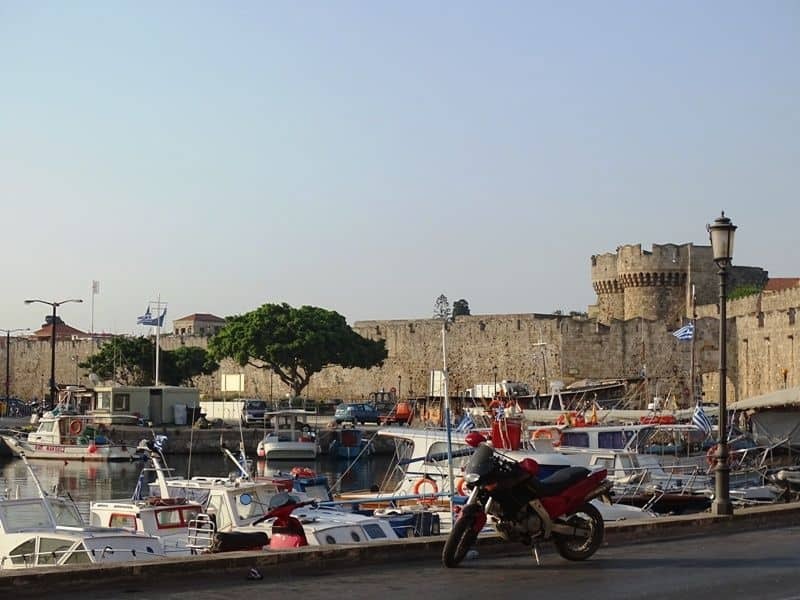 Rhodes is also known as the island of the knights. 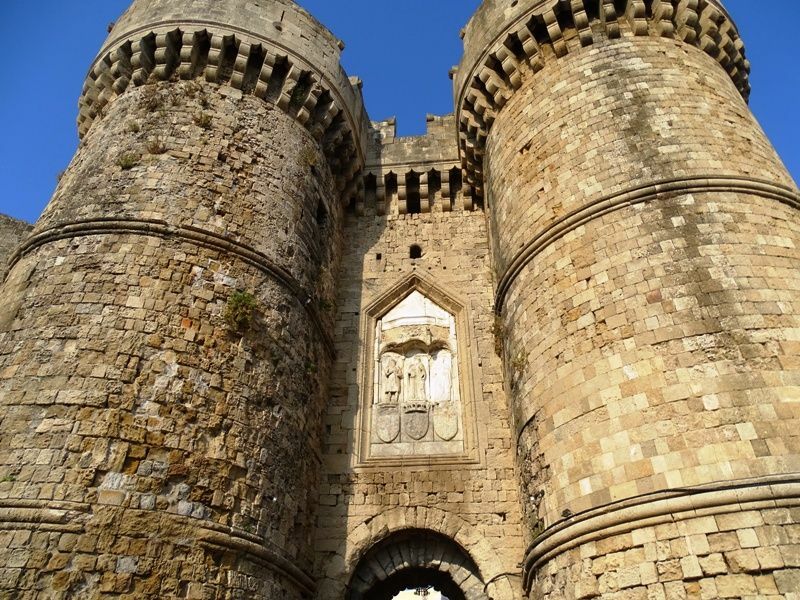 The island of Rhodes is full of history and rich heritage. At the town of Rhodes the visitor has a wide choice of things to do and see. My trip to Rhodes was quiet short. I went there for a full day since Aegean Airlines had a super offer. The round trip to Rhodes island including tax cost me 28 euros. I couldn’t miss this kind of offer. 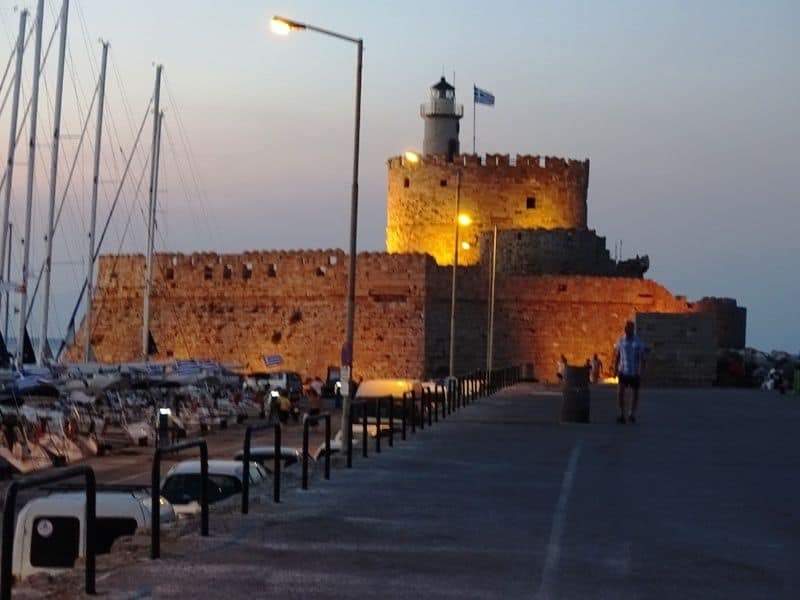 A lot of cruise ships stop for a day at Rhodes harbour, so I hope this guide will be helpful to visitors coming with the cruise ships as well. By Air: Rhodes international airport “Diagoras” is located just 14km away from Rhodes city centre. From the airport you can either take a bus to the city centre or a taxi. 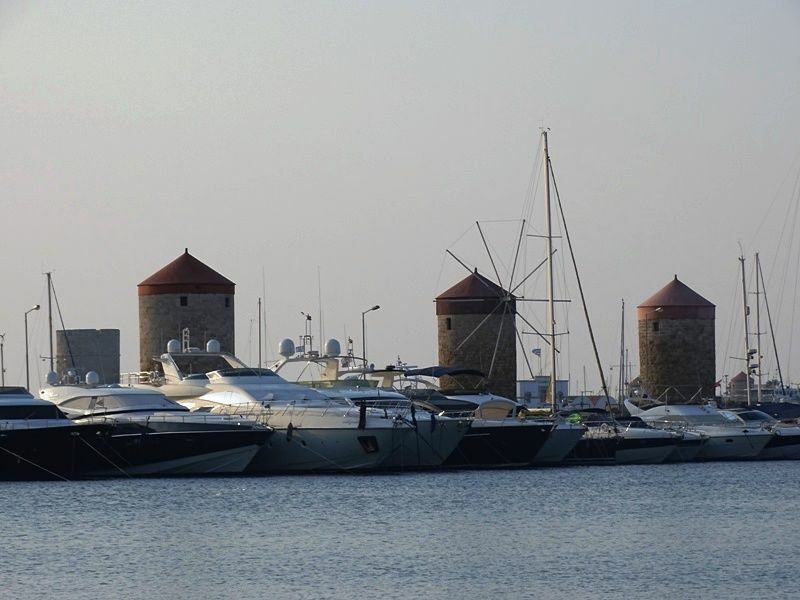 By Boat: Rhodes harbour is located in the city centre. 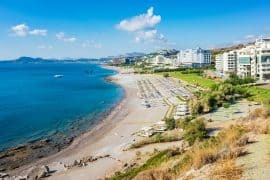 There is a daily connection from Piraeus port in Athens to Rhodes with stopovers to a couple of islands. 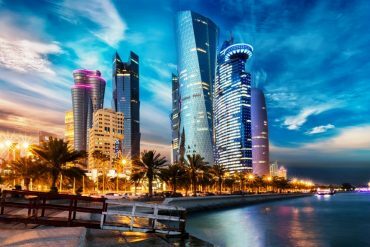 The trip lasts approximately 12 hours. 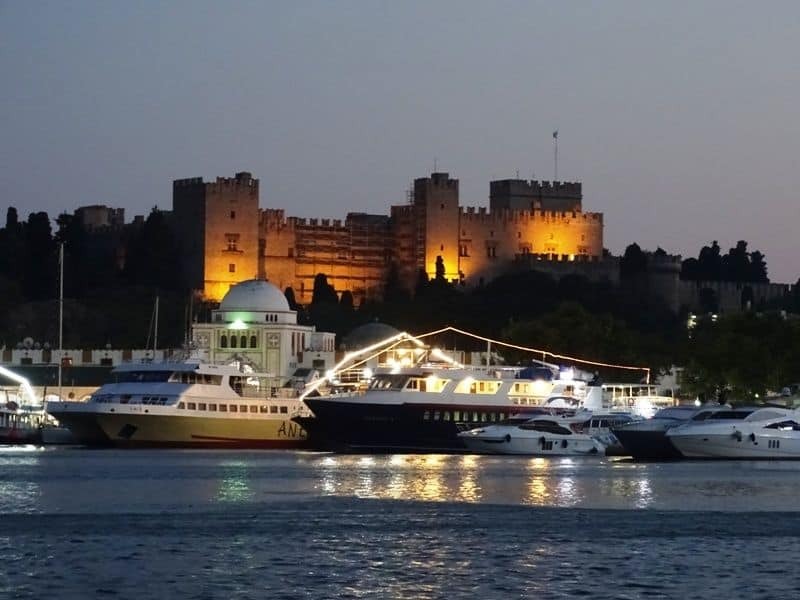 There is also a ferry connection from Rhodes to the other Dodecanese islands like Kos and Patmos, and other islands like Crete and Santorini. Rhodes is also a popular destination for cruise ships. 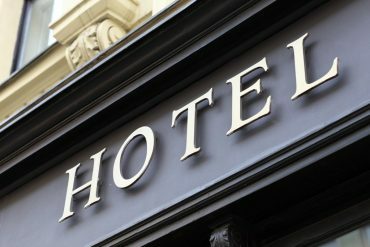 Check out the latest prices and more details at Hotels.com or Booking.com. 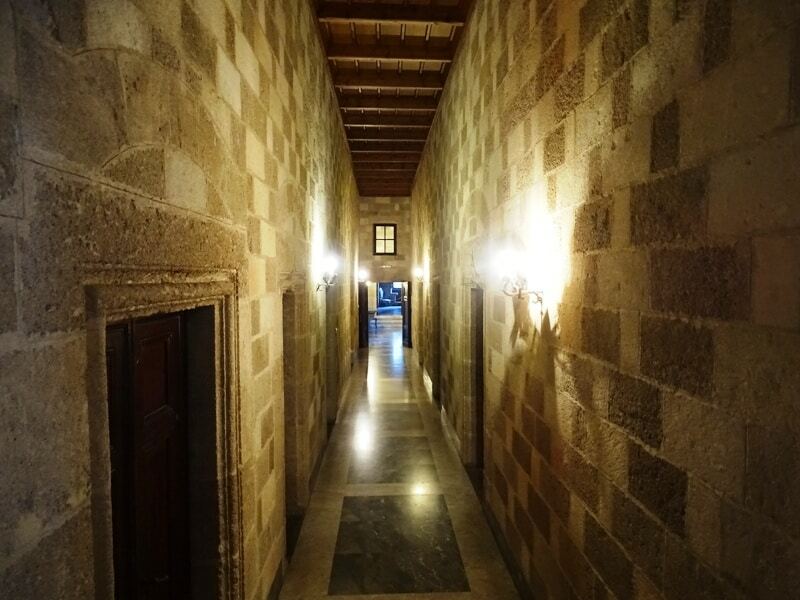 In the heart of the old town is the Sperveri Boutique Hotel. 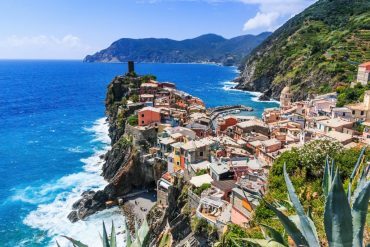 It is a short ten minute walk to the beach and steps from local restaurants and bars; there is also a bar within the hotel. Some rooms have a small terrace or balcony, while others feature a seating area; if you have a request, don’t hesitate to ask when booking! Should you choose to stay at one of the larger hotels in Rhodes Town, you might prefer either the Blue Sky Beach Hotel or the Ibiscus Hotel. 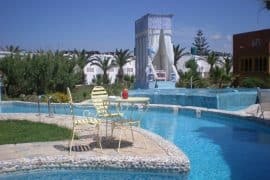 The Blue Sky Beach Hotel is a good spot for families with small children, as it is right on the beach and has all the modern facilities you could want. Town is about a ten minute walk from the Blue Sky. The Ibiscus Hotel is at the end of the point, a few minutes walk from both the old town and the beach. 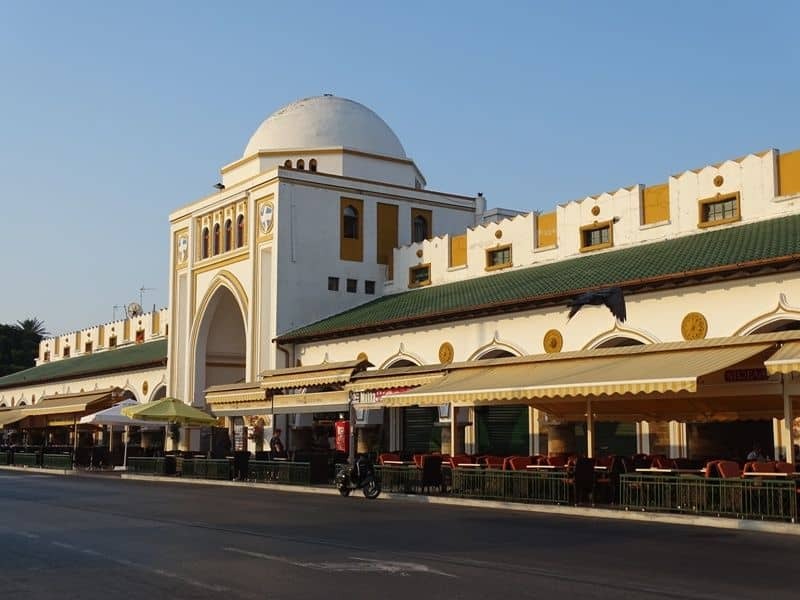 For travellers who seek modern amenities while being close to the historical centre, this is an ideal hotel. Both of these hotels have onsite bars and restaurants, but are also close to local tavernas. 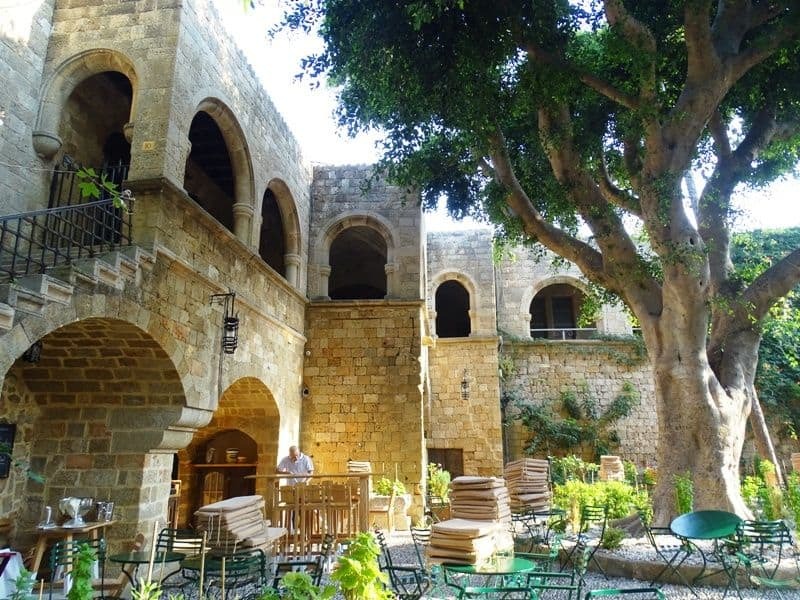 You might also be interested in: Where to stay in Rhodes. 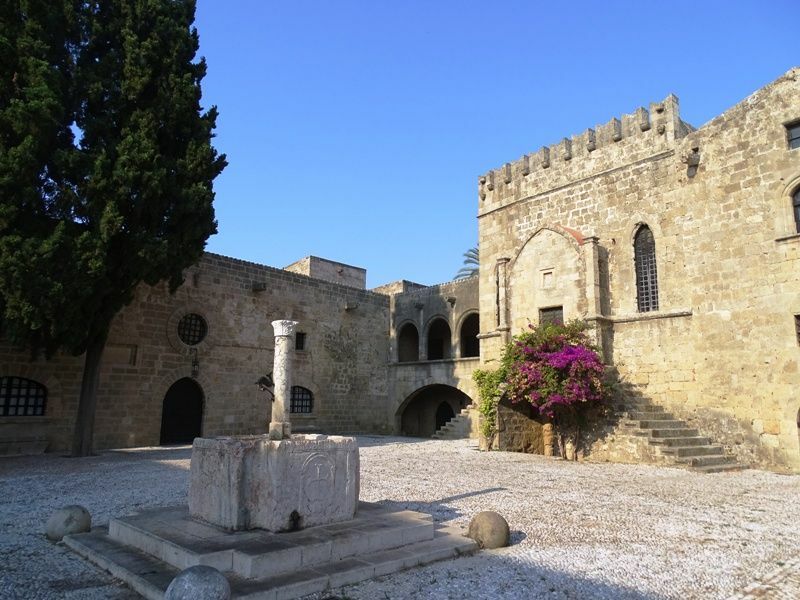 Rhodes town was declared as a World Heritage Site by UNESCO. It is considered the largest and best preserved fortified city in Europe. Rodos town has many influences. 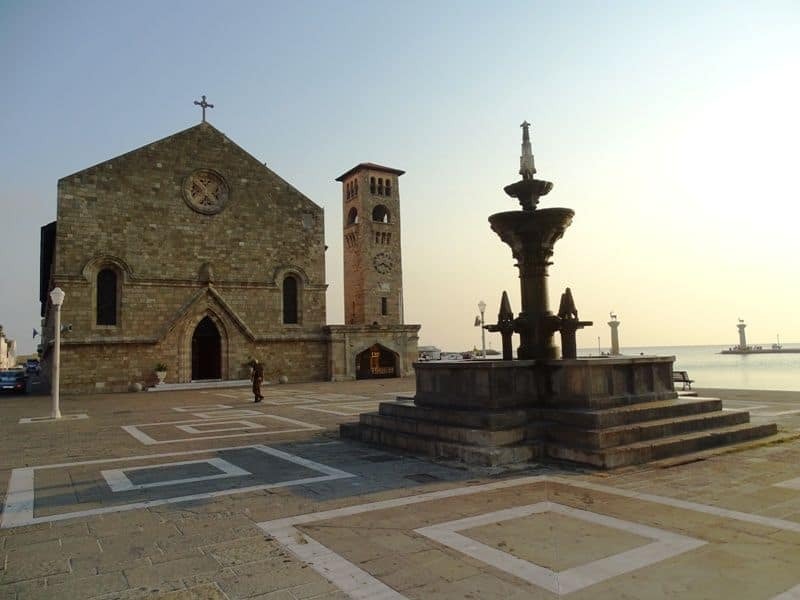 You will see spread around the town buildings from the Hellenistic, Ottoman, Byzantine and Italian period. 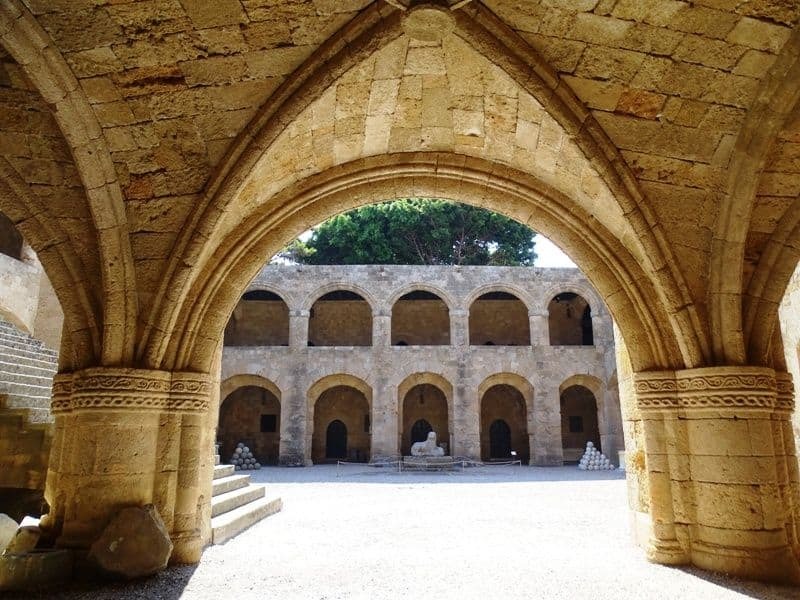 Here is a list of places worth seeing in the town of Rhodes. 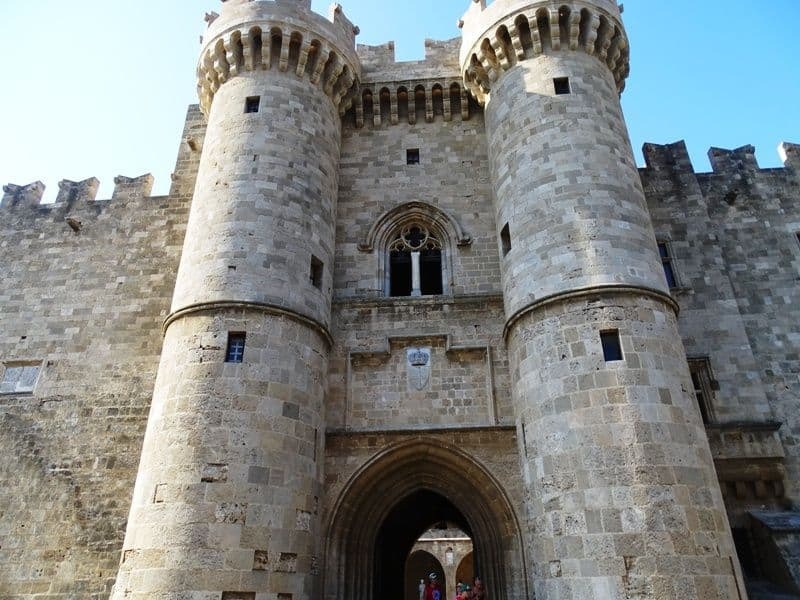 Many of Rhodes tourist attractions can be found within the walls of the Medieval City. 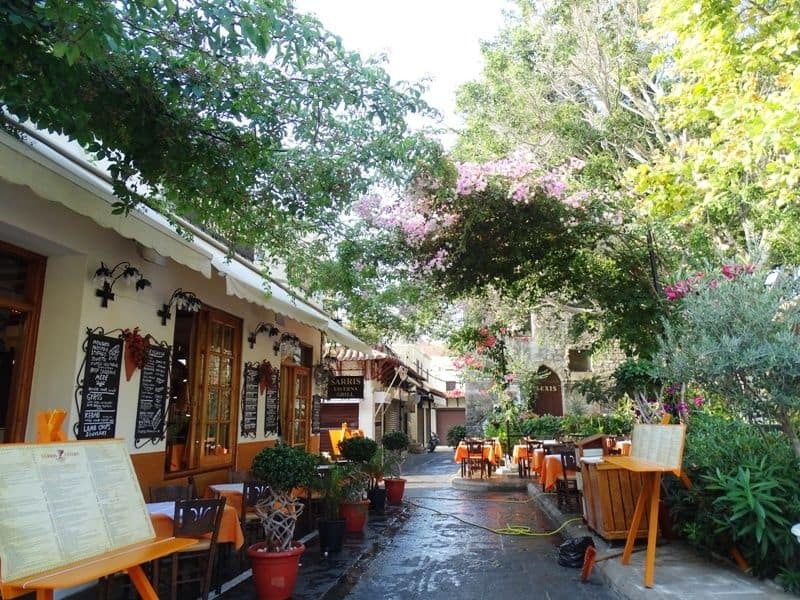 You can walk within this picturesque town with the small alleys and the traditional buildings. The main road that crosses the medieval town is called the Street of Knights. 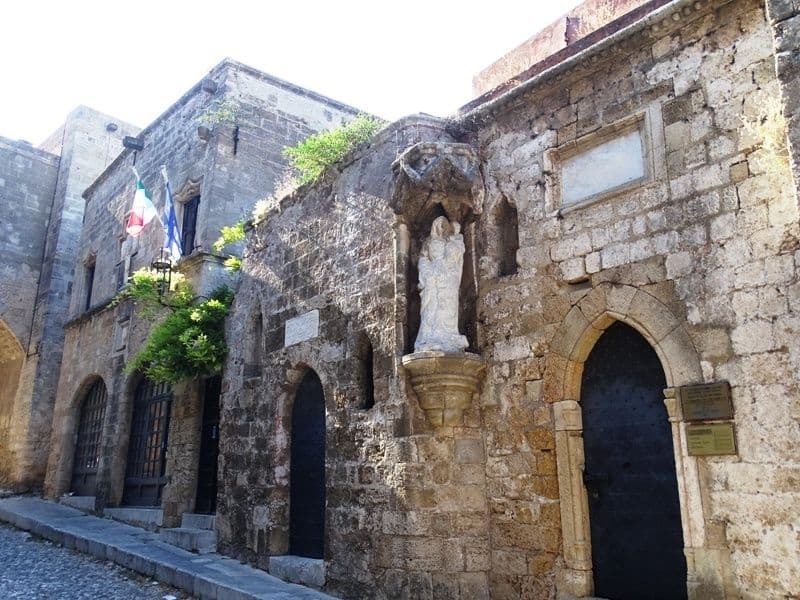 It is a very well-preserved street that starts from the Archaeological Museum and ends at the Palace of the Grand Master. 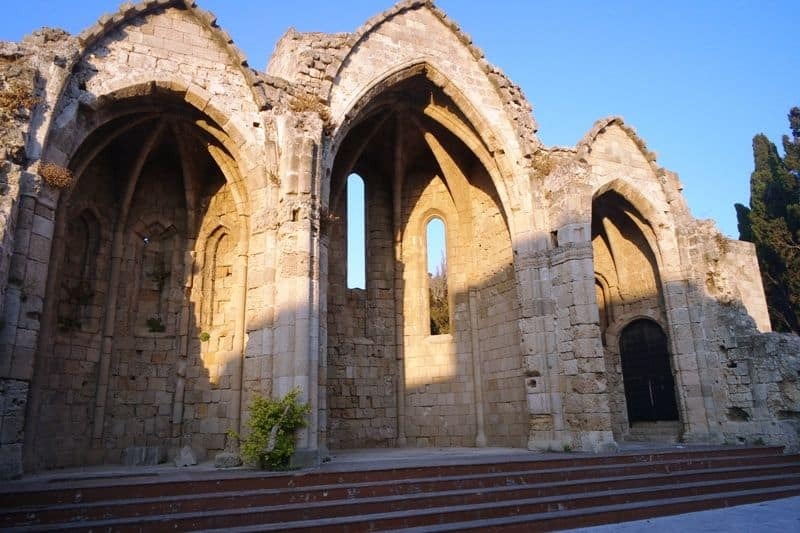 It is located within the Medieval city and it is considered one of the most important monuments. 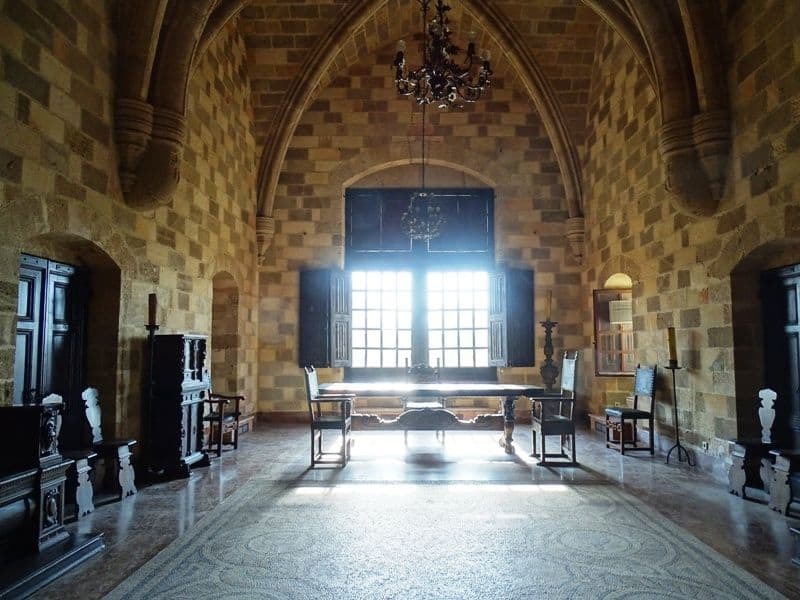 The visitor will see medieval furniture, mirrors, paintings etc. It also houses the Byzantine Museum. 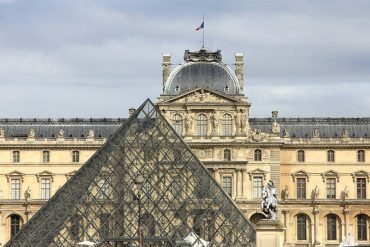 There is also a special ticket package available that costs 10 € full price and 5 € reduced price and includes the Grand Masters’ Palace, the Archaeological Museum, the church of Our Lady of the Castle and the Decorative Arts Collection. 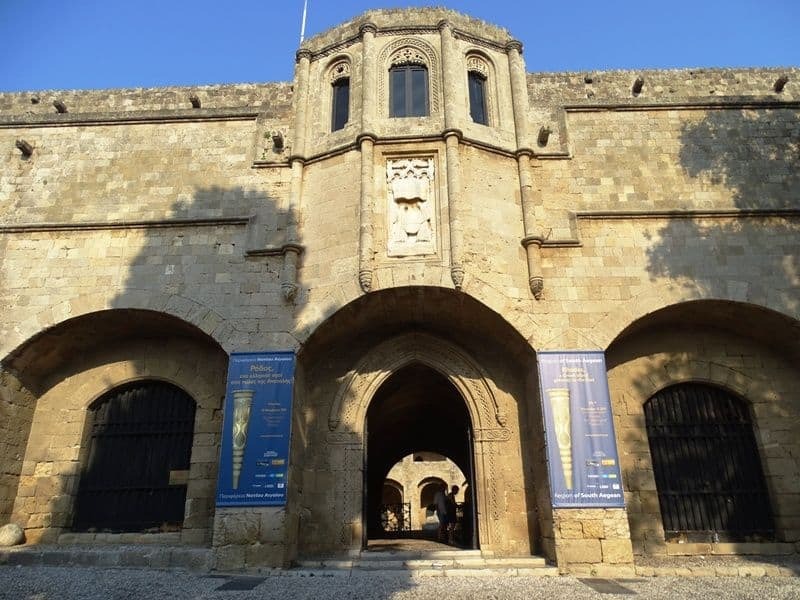 The lower level part of the RHODES 2400 YEARS Exhibition is temporarily closed for maintenance. 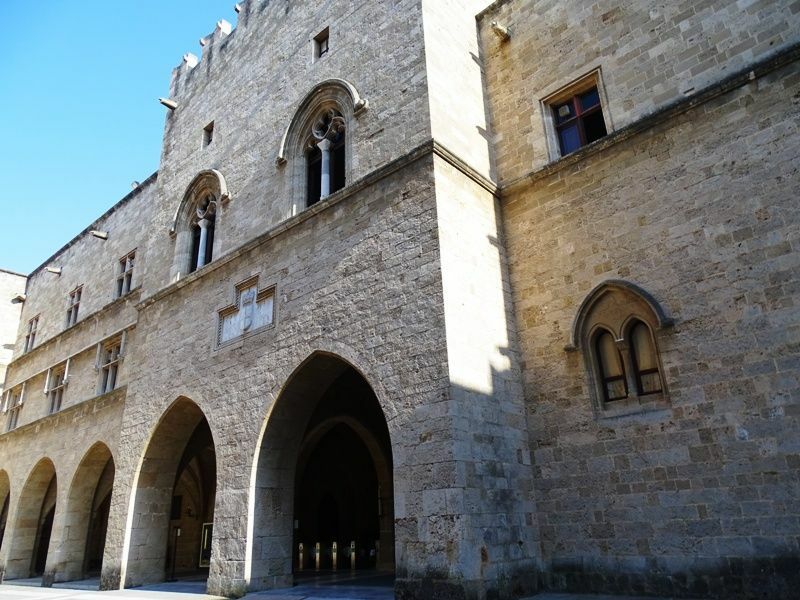 The Archaeological Museum of Rhodes is housed at 15th century building of the Hospital of the Knights. 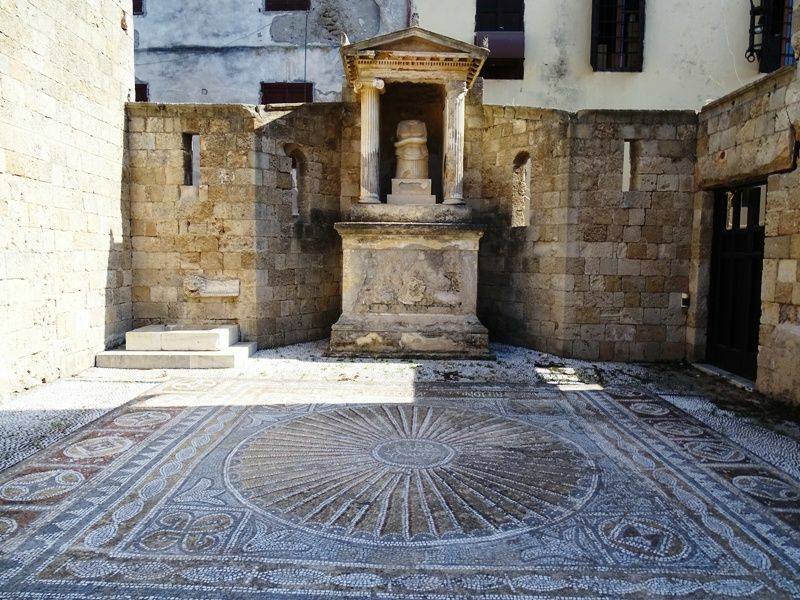 It has a vast collection of findings from the excavations of the island of Rhodes and the surrounding islands. At the Acropolis apart from the incredible views you will see the ancient stadium of Diagoras and the ruins of the Temple of Apollo. The entrance is free. If you want to see the town from the top then you should climb the stairs up to Clock tower. Tickets cost 5 € and can be exchanged with a refreshment at the cafe when you go down. 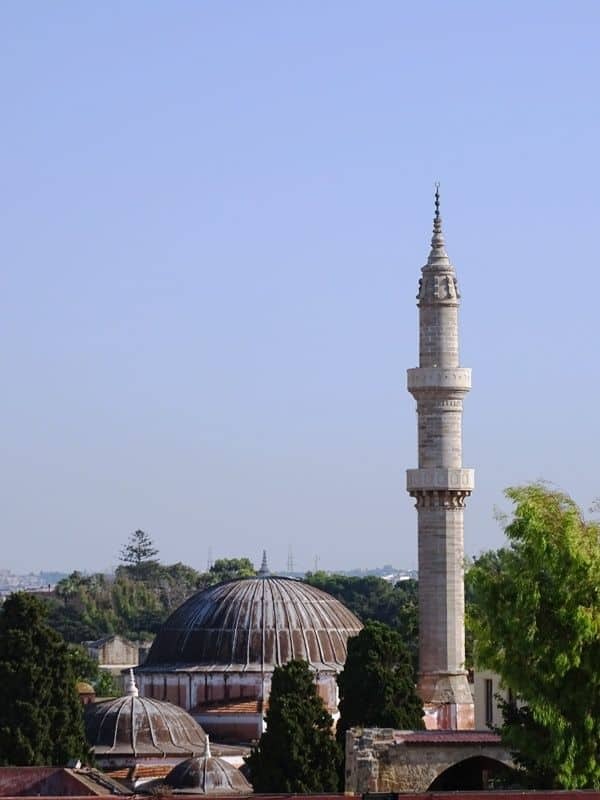 It was the first mosque constructed in Rhodes. It was named after Sultan Suleiman to commemorate his conquest of the island. It was built-in the 11th century and used to be the Knights Cathedral. 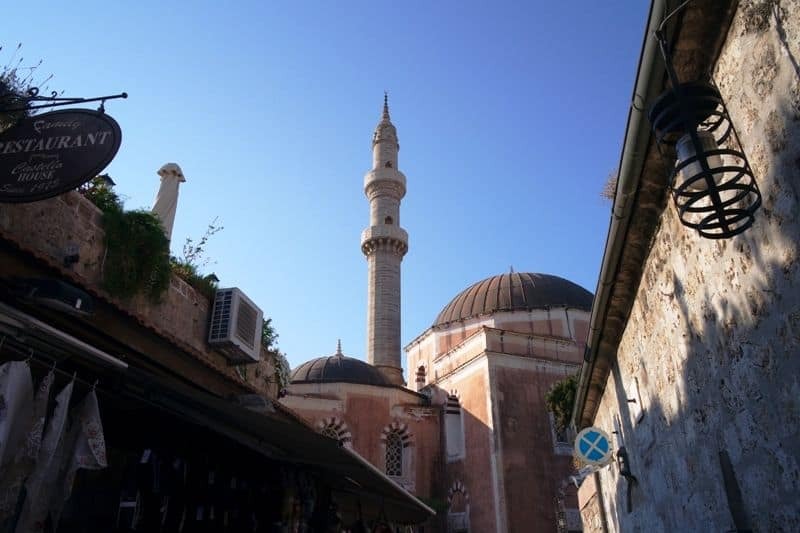 During the Ottoman occupation it was turned into a mosque. It is situated at the end of Mandraki harbour. It was built by the knights of St John in the 15th century. It used to be the port of ancient Rhodes. 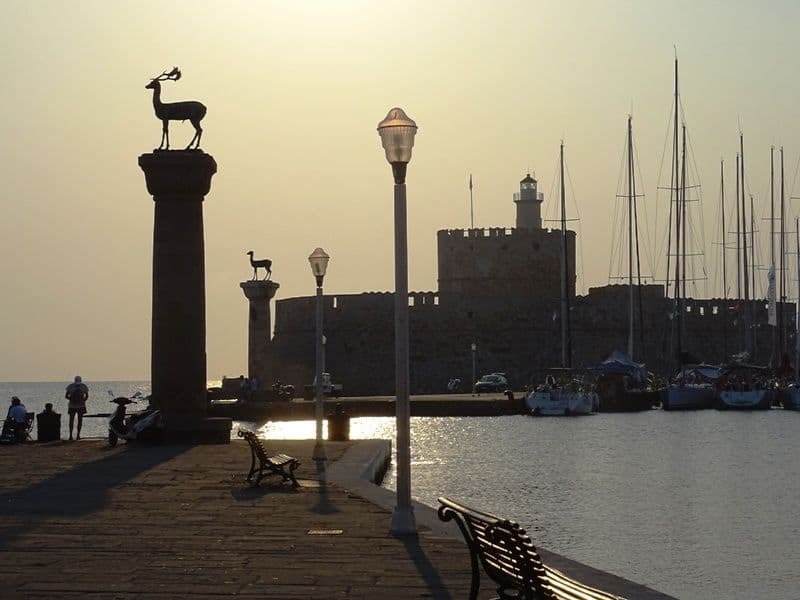 At the entrance of the port you will see a female and male deer that are the symbols of the city. You will also see three medieval windmills and the fort of St Nicholas. If you are staying in Rhodes island longer than a day you can take from here a boat and make a day trip to Symi islands. 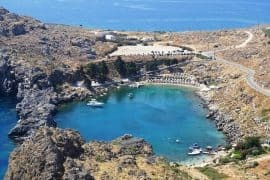 There are some other places to visit in Rhodes island that I didn’t have the time like the Rodini Park which is situated 3km away from the city to the road that goes to Lindos. It is a park with rich fauna and a small zoo. You can also visit the Aquarium especially if you are traveling with children. Even though I only spent a day in Rhodes, apart from the city of Rhodes I managed to visit Lindos as well and absolutely loved it. Rhodes is such a beautiful island and I will come back in the future to explore it further. 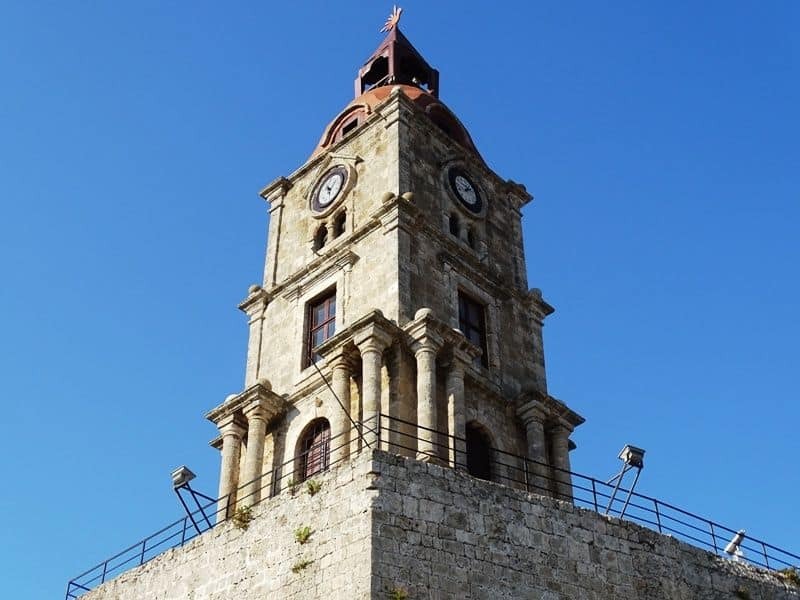 If you are staying in Rhodes Old Town you will want to take a bus or a taxi from the airport to reach your destination. Taking a taxi is the fastest option but the bus is a cheaper alternative. You could also check to see if your hotel offers airport transfers to save you the hassle of arranging anything yourself! For the cheapest route from Rhodes Airport into the main town centre, you’ll want to catch the public bus which leaves from outside a coffee shop outside the main terminal. This is fairly easy to find and any airport staff will be able to point you in the right direction. Buses run from 6.40am – 23.15pm and have wait times that range from 10 – 40 minutes depending on the time of day. Tickets are purchased directly from the driver (in Euros cash) when you board the bus and costs just 2.50 EUR. The last top arrives into Rhodes city centre and lies around 5 minutes from both the waterfront and Old Town. From here you can either walk or take a short taxi to your hotel. Taxis are available from Rhodes Airport day and night and depending on the time you arrive there may be a short wait at the taxi rank before you can start your journey. 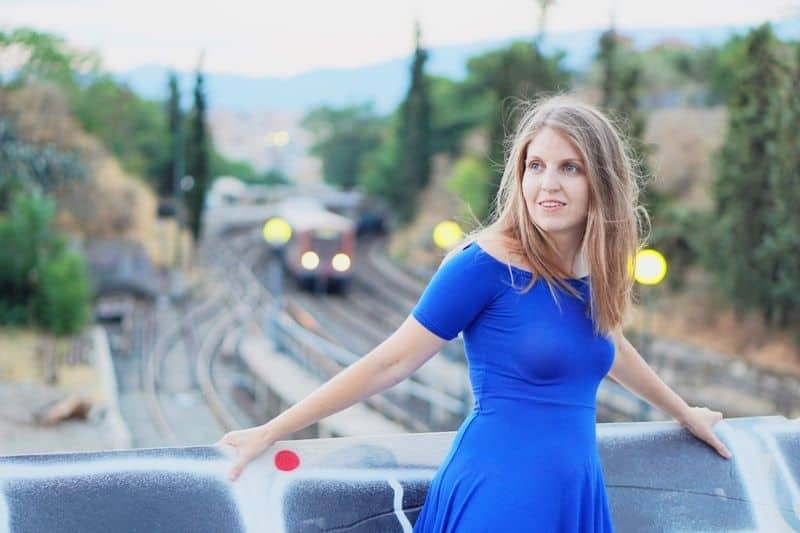 In general, the route from Rhodes Airport to the town centre takes around 20 minutes and costs 29.50 during the day and 32.50 between the hours of midnight and 5am. For added convenience you can book a pre-booked taxi through Welcome Pick-Ups. This service will allow you to have a driver waiting for you at arrivals who will help you with your bags and offer you travel tips on what to do in Rhodes. Click here for more information and to book your private transfer. Check out the best beaches around Rhodes. Have you ever been to Rhodes? Rhodes looks like an awesome place to visit. I hadn’t heard of it before. It is one of the many beautiful places in Greece! 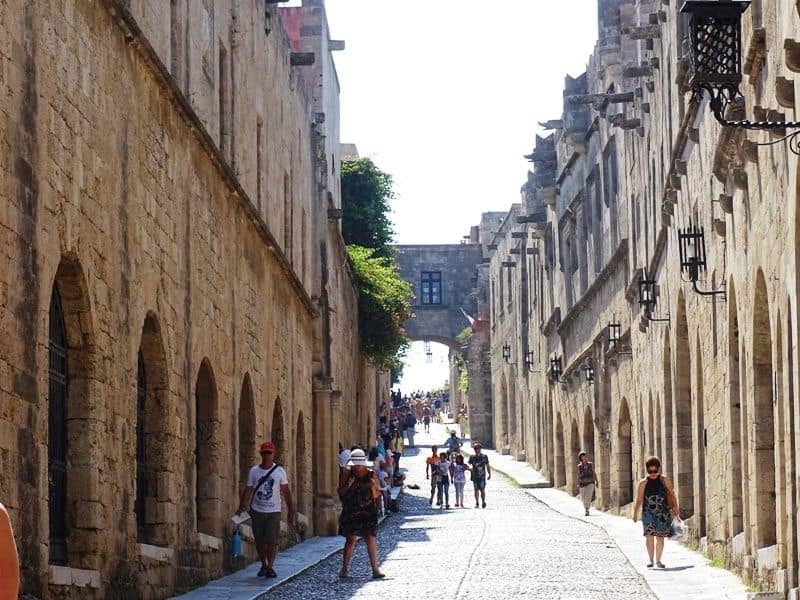 Rhodes looks like such a beautiful place — especially the medieval buildings. I would love to go there someday. And I think I would want to spend much more than one day there! 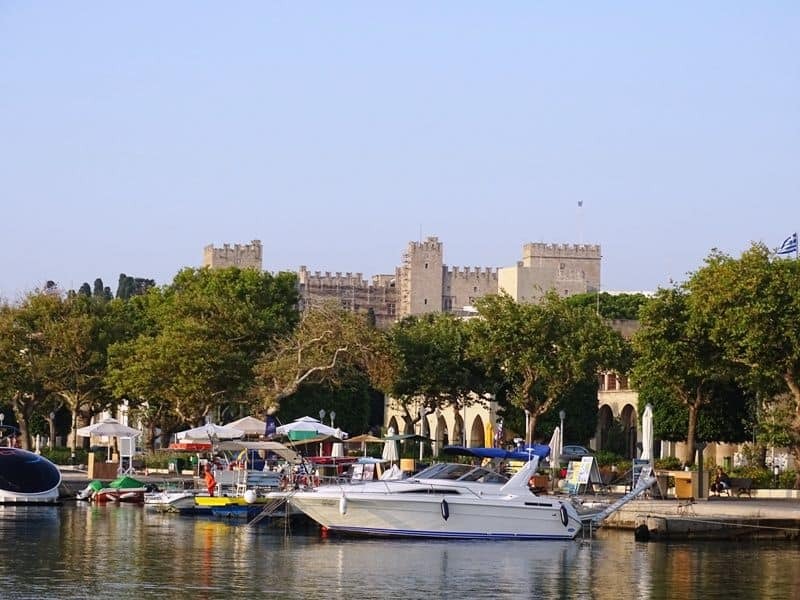 Rhodes is a big island with many things to do and see so you need a couple of days to see it all! Rodes Town is such a beautiful place. I went there once when I was younger and remember the positive impression it left on me. Can’t wait to go back. It is very beautiful. I hope you can make it back soon! WOW the Palace of the Grand Master is amazing! I would love to visit someday! I was in awe from the first time I set foot in the medieval town of Rhodes.So beautiful..
We are going to Rhodes for a day on our cruise. Should we pay for a professional tour of the medieval city or just go there ourselves and explore? Hello, I think it’s easy to explore the medieval city on your own as we did. It;s not very big and youonly need a map. Now I would reccommend a professional tour only if you want to learn a lot about the history of the place. Note that in every museum there is an english sign underneath. 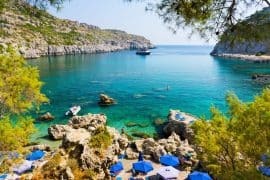 Ok, so I’ve just stumbled upon your post about Rhodes and your blog, and I will definitely be adding it to my Greece bucket list! Looks like an wonderful town I would reallllly love! Thanks for stopping by. Rhodes has one of the prettiest towns I have ever seen. You should cdefinitely visit. We’re visiting in June from Turkey for an overnight stay and very much looking forward to it now. Thank you for all this information. Thank you, Carole, for your comment. Have a nice time in Rhodes, it is a wonderful town. 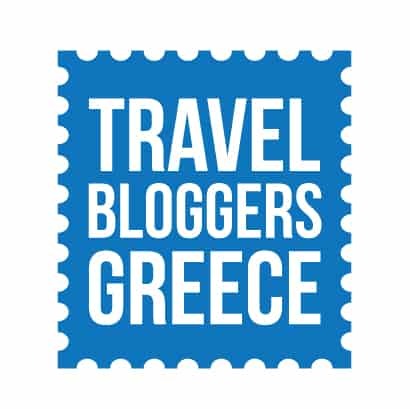 Hello Chrissy, I just found your blog via Pinterest as I’m planning our one day stay on Rhodes Island. We will be arriving via cruise and have only about 9 hours on the island. You mentioned seeing both Rhodes town and Lindos during your one day stay, do you think it is possible to visit both in 9 hours? 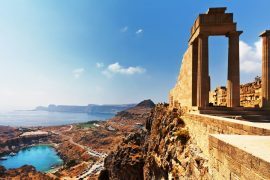 Would you suggest going to Lindos first and then Rhodes Town or just staying in Rhodes Town for the whole day? Thank you! Hello Danielle, I did see both in about 12 hours. It will be a tiring day but it is worth it. As soon as you get off your cruise ship go and take the bus to Lindos. Don’t stay in Lindos more than two hours so that you have time to see Rhodes old town too. 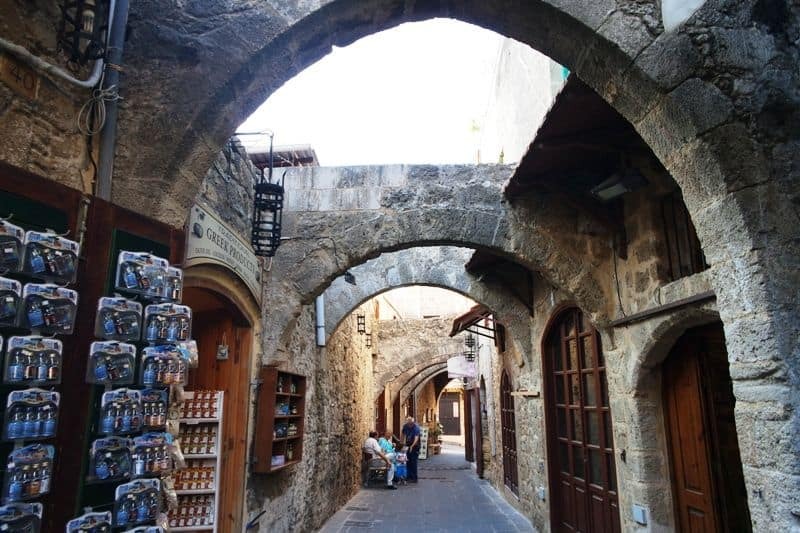 The good thing is that Rhodes medieval town is walkable and relatively small. Enjoy your time in Rhodes.